Radio remains popular despite more than a half-century from television, music theaters, video, cable and now computers. One reason is that radio receivers always have been offered in enormous sizes. If you wanted a big radio, you could always get one. Yesterday's Atwater-Kent consoles have given way to today's Bose house-rockers. On the other hand, pocket portables have shrunk to almost absurd proportions, perhaps none smaller than the "FM Sounds" radio from American Technology Corp.
A one-earphone-only model, this quarter-ounce powerhouse is small enough to fit in a tablespoon. The size takes people aback. But this is no toy. 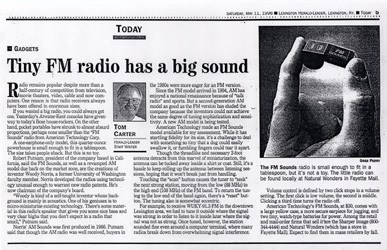 Robert Putnam, president of the company based in California, said the FM Sounds, as well as a revamped AM model due back on the market soon, are the creations of inventor Woody Norris, a former University of Washington faculty member. Norris developed the radios using technology unusual enough to warrant new radio patents. He's now chairman of the company's board. "Woody is kind of a self-taught inventor whose background is mainly in acoustics. One of his geniuses is to micro-miniaturize existing technology. There's some material in this radio's speaker that gives you some nice bass and very clear highs that you don't expect in a radio that small," Putnam said. Norris' AM Sounds was first produced in 1986. Putnam said that though the AM radio was well received, buyers in the 1980's were more eager for an FM version. Since the FM model arrived in 1994, AM has enjoyed a national renaissance because of "talk radio" and sports. But a second-generation AM model as good as the FM version has eluded the company because the inventors could not achieve the same degree of tuning sophistication and sensitivity. A new AM model is being tested. American Technology made an FM Sounds model available for my assessment. While it has startling fidelity for its size, it's a challenge to deal with something so tiny that a dog could easily swallow it, or fumbling fingers could tear it apart. Though the threadlike and necessary 2-foot antenna detracts from this marvel of miniaturization, the antenna can be tucked away inside a shirt or coat. Still, it's a hassle to keep rolling up the antenna between listening sessions, hoping that it won't break just from handling. Touching the "scan" button causes the tuner to "seek" the next strong station, moving from the low (88 MHz) to the high end (108 MHz) of the FM band. To return the tuning to the low end of the band again, there's a "reset" button. The tuning also is somewhat eccentric. For example, to receive WUKY-91.3 FM in the downtown Lexington area, we had to tune it outside where the signal was strong in order to listen to it inside later where the signal was not as strong. Once tuned, however, the station sounded fine even around a computer terminal, where many radios break down from overwhelming signal interference. Volume control is defined by two click stops in a volume setting. The first click is low volume, the second is middle. Clicking a third time turns the radio off. American Technology's FM Sound's, at $30, comes with a large yellow case, a more secure earpiece for jogging, and two tiny, watch-type batteries for power. Among the retail and mail-order firms that sell sit are the Sharper Image (800-344-4444) and Natural Wonders (which has a store in Fayette Mall). Expect to find them in mass retailers by fall. The FM Sounds radio is small enough to fit in a tablespoon, but it's not a toy. The little radio can be found locally at Natural Wonders in Fayette Mall.